Annie Sloan Archives - Vintage Shrewsbury Ltd.
We have been stocking the wonderful, and ever-expanding, range of decorative products by Annie Sloan since moving to our current premises in 2011. 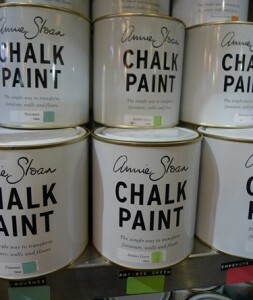 Since then Annie has, quite rightly, become a household name, leading a GLOBAL painted furniture revolution with the Chalk Paint™ she invented; quite simply THE BEST PAINT IN THE WORLD for furniture & walls! As well as maintaining a good stock of the whole product range, with good advice on decorative painting in general freely available, we also use the paint on pieces to sell in the shop ourselves and run regular, more ‘in-depth’, workshops to help our customers create even better pieces themselves.